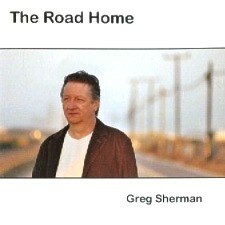 Greg Sherman - "The Road Home"
Greg Sherman is the keyboard wizard behind California progressive rock act Glass. And although he utilizes a wide array of different keyboards with his band, for this solo effort, he strips things down to basics, getting back to his roots and just playing the piano. Influenced by both classical music and solo piano improvisers such as Keith Jarrett, Greg weaves thirteen captivating compositions on The Road Home, starting with the philosophy that everyone has a road home, though those roads may be quite different from each other, depending on who is walking or driving them. Unlike on his previous solo effort, Zutique, which was just straight solo piano (and from which one of the songs lends its title to this album), Greg is joined on a number of tracks on The Road Home by former Glass drummer Paul Black, who plays hand percussion, and it lends many of the pieces a kind of pleasant, folksy feel, despite the main instrument being the piano. Greg is even joined on one track, Just to See You Shine, by his brother Jeff, who plays acoustic guitar. The songs ring with honesty, their melodies crafted to evoke images and memories in each listener, regardless of the memories the composer may have had in mind. One definitely does get a sense of freewheeling wanderlust in these compositions, whether the mood is one of melancholy and loneliness or one of carefree joy and spirited adventure. But there are many moods explored, from the sombre mediation of Out of the Darkness to the dreamy pleasure of Bohemian Fantasy to the peaceful, windblown freedom of Open Sky, understanding that one can feel many things and have many kinds of thoughts on the road home. Those looking for Greg Sherman's stellar keyboard wizardry may have to stick with just listening to Glass, but for those who want to explore a gentler and yes, folksier side to his performing and song writing, The Road Home provides some simpler delights that resonate with integrity and the pure pleasure of playing music. It's also worthy to note that one dollar from every sale of this CD will be donated to The National Coalition for the Homeless, perhaps in the hope that it will help those less fortunate to find their roads home as well.